Membership of SELOC and access to the forum will continue to be FREE for everyone. However, SELOC needs to raise money to be able to continue to run and put on the type of events that have been so successful to date. Therefore we would hope that some members will help support the club by taking out "Club Supporter" membership. Your contribution - £15 per year. If you have any questions about membership please contact our . 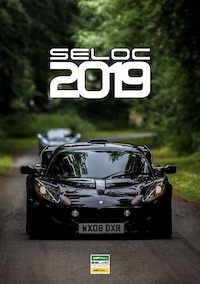 Not only will you be helping to ensure SELOC can continue you will also receive a free wall calendar, containing great shots of Lotuses taken by fellow members. Calendars are posted out to all eligible members during December. If you purchase membership on/after the 1st of January, you'll receive your calendar the following December. Bell & Colvill - The World's Oldest Lotus Main Dealer 8% off parts and labour with up to 35% discount on service labour. The best known stamp to have in your service book. Friendly knowledgeable staff, technicians highly trained by the Lotus factory Large selection of cars, including exhibits of classic Lotus from the past. 10% off labour charges at Maidstone Sportscars, Kent. Up to 12% off tyres from Camskill Performance & Tyres, Whitehaven. FREE postage on anything bought from Car Audio Direct. Up to 25% off selected road tuning parts for cars and bikes from Demon Tweeks. 10% off Hangar 111's own-branded products. Please call to place your discounted order, online discounts not yet available. Discounted Yokohama A048 R Advan - Track Day Tyres from RaceTyres, York. 20-25% off selected racesuits from AWS RaceWear. 40MiB of SELOC Gallery space. 1,000 U2U limit (intra-forum personal message service). FREE SELOC Lotus wall calendar. In addition, Club Supporters will also be covered by the Articles of Association and thus will receive the same liability cover as the Directors of SELOC Limited (for arranging road runs as an example). Although shares aren't being issued this would be similar to being a shareholder of a normal Limited company. SELOC will remain a not-for-profit club and we will continue to drive forwards to get as many Lotus Enthusiasts to join as possible. SELOC will continue to be free for anyone who wants to join.